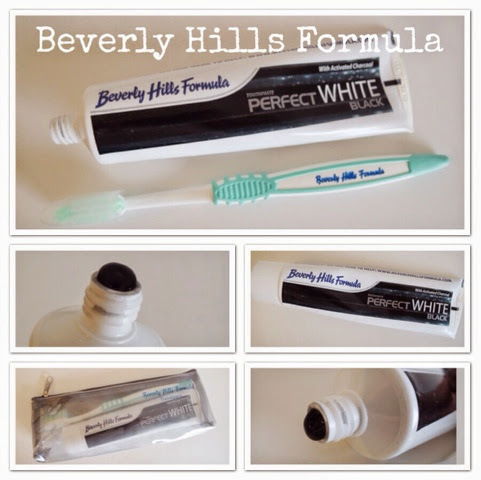 I was recently contacted to ask if I would be interested in reviewing the new Beverly Hills formula perfect white black*. When the heard the word black charcoal toothpaste it immediately grabbed my attention. So hydrated Silica combined with Activate Charcoal offers high performance whitening boost that makes toothpaste safe for every use. Addition to its antibacterial properties, Activated Charcoal is also known for its love of tannins - compound found in coffee, tea, wine, berries and spices, all of which stain your teeth; the activated charcoal helps remove tannins from the surface of your teeth without harming your enamel...interesting stuff! I have been using it for almost 2 weeks now and I really enjoy using it! I quite like that it's black...rather unusual and its super minty! I think I would need to use it for longer to see any whitening effects but overall I am please with this item and I have already recommended it to my colleagues since they were all intrigued by the colour! For those of you in UK it can easily be purchase in your local Superdrug or for the rest you it can be purchase from Amazon. OOOOHH this sounds so interesting!! I wana buy one to try. You can pick them up in Superdrug easily now! Try and let me know what you think!